Guys. I can’t lie to you. I’m in Mexico right now, watching the waves come crashing in as I bake in the sun like the lobster I am (just kidding, Mom and Dad, I have SPF 50 on). Regardless. Today I have an awesome recipe for you guys: Spring Green Pizza. I associate pizza with cooking with my family. Rolling out dough, making individual pizzas, and taking a bite of everyone’s to see who made the best one. While I love ordering a ‘za from a pizza place, ultimately, to me, pizza means family. It means time spent together, a shared experience grounded in creativity and happiness. 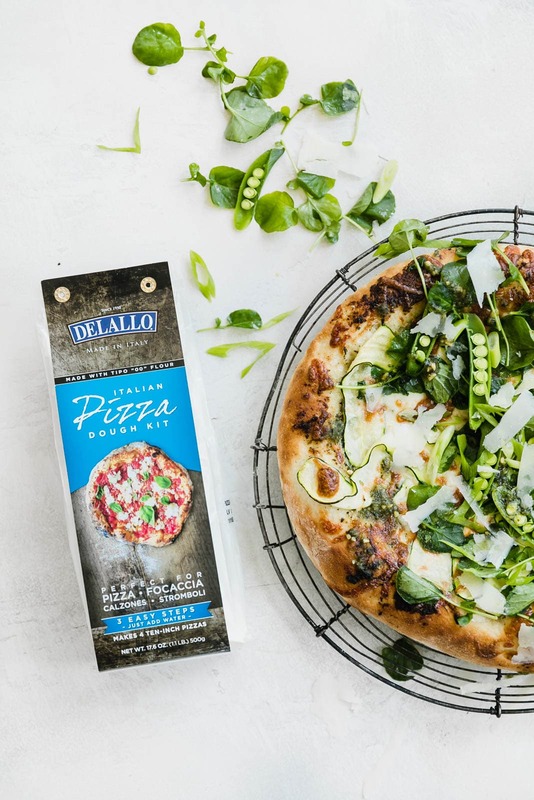 This Spring Green Goddess Pizza is made with my absolute favorite dough, DeLallo’s Pizza Dough Kit. I honestly think I’m the number one fan of this dough, because I tell DeLallo every time we talk how obsessed with it I am. 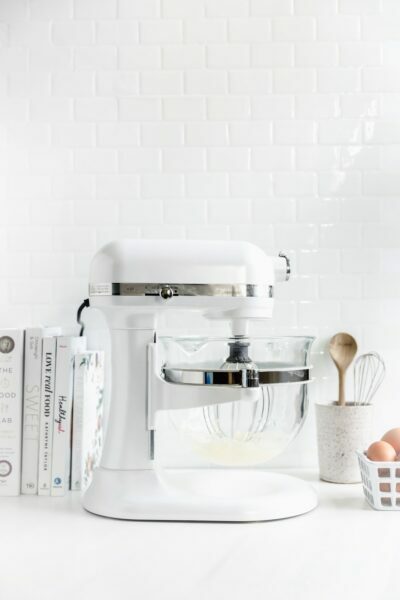 It makes the homemade pizza process accessible, quick, and easy. The dough kit comes with 2 packets you stir together with warm water and knead for a few minutes. Then leave it be for an hour, and you have a perfect homemade pizza dough. You really can’t mess it up. And the flavor is fantastic. 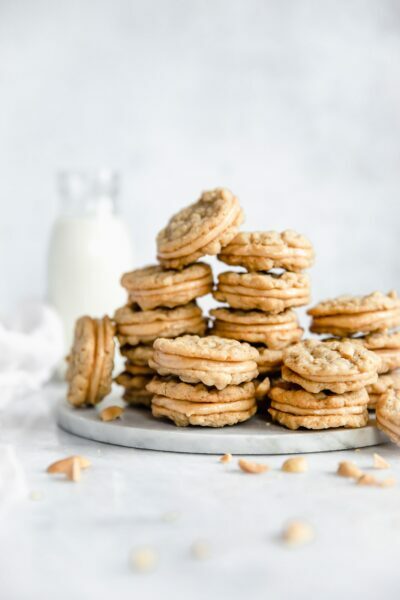 Great crunch, a golden crust, and a chewy center. 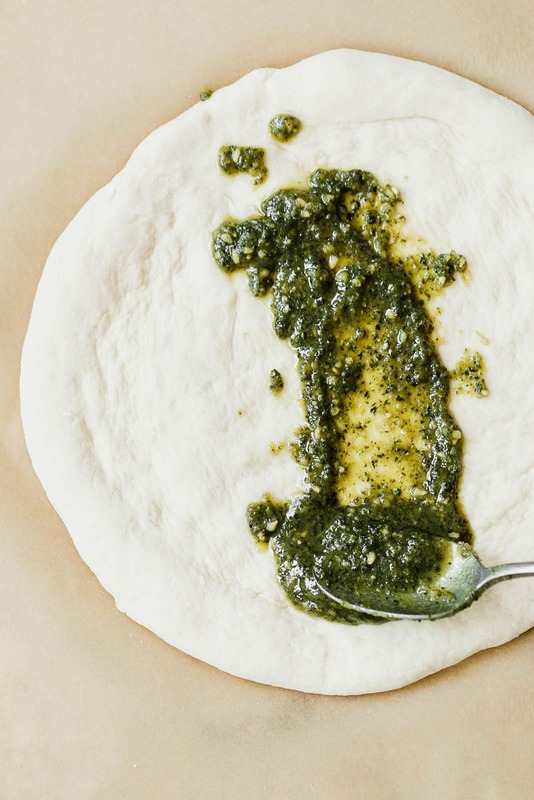 It makes for the perfect base for the homemade green pesto pizza of your dreams. What’s on this spring green pizza? 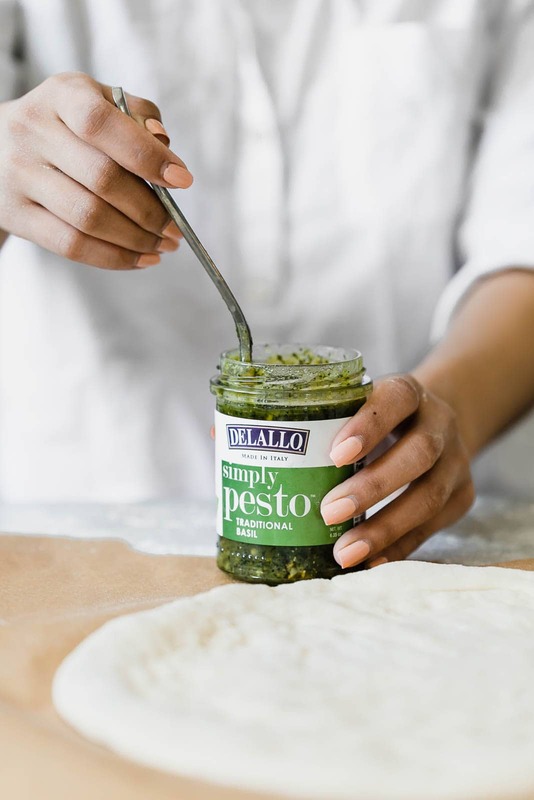 DeLallo Simply Pesto Sauce — I LOVE this pesto sauce. 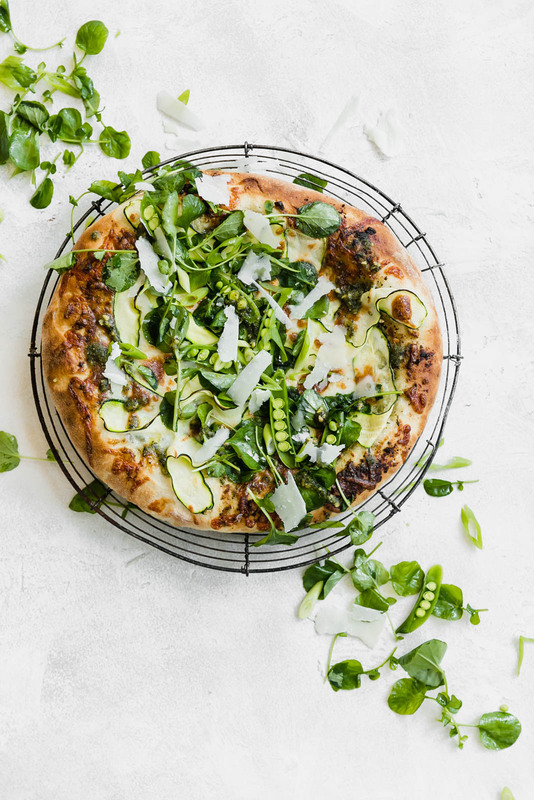 Using a high-quality pesto from the store cuts down the prep work for this spring green pizza and makes it easier to spend more time with your family while the pizza dough rises. Freshly grated mozarella — For the best flavor, fresh mozz is a must. You can easily grate it yourself (or just roughly tear it with your hands, whatever is easiest). Fresh mozzarella is much creamier and richer in flavor than the bagged shredded stuff. 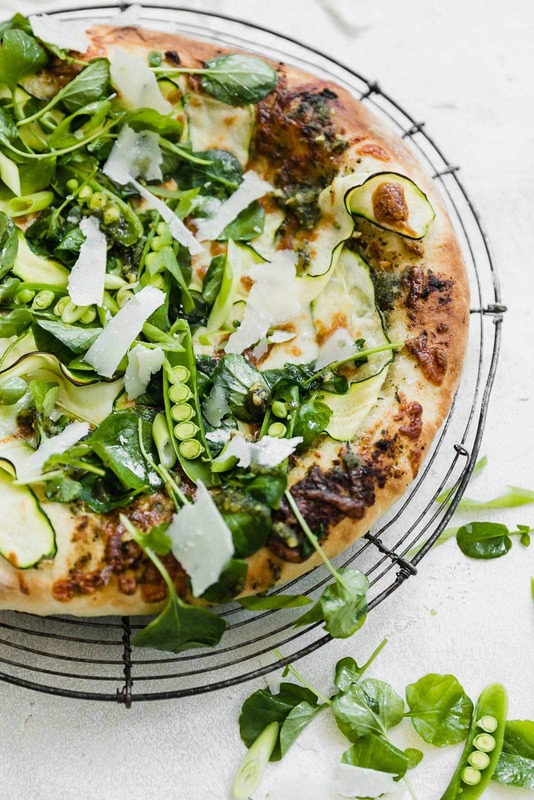 Spring vegetables — For this green pesto pizza, I used a slew of spring veggies. 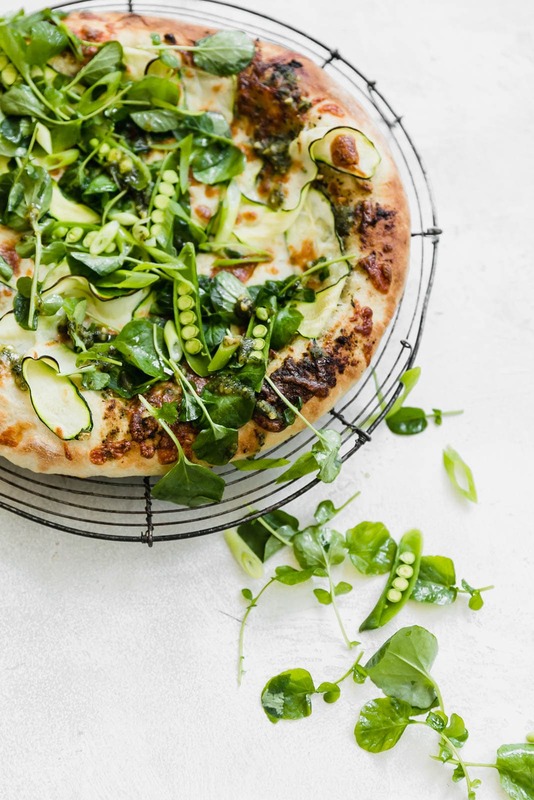 Zucchini, watercress, and sugar snap peas add a pop of freshness to this pizza and complement the pesto sauce without totally overwhelming it. Green goddess dressing — You don’t need much green goddess dressing, just enough to lightly coat the spring veggies and add some flavor. Buy your favorite green goddess dressing from the store, or make your own. 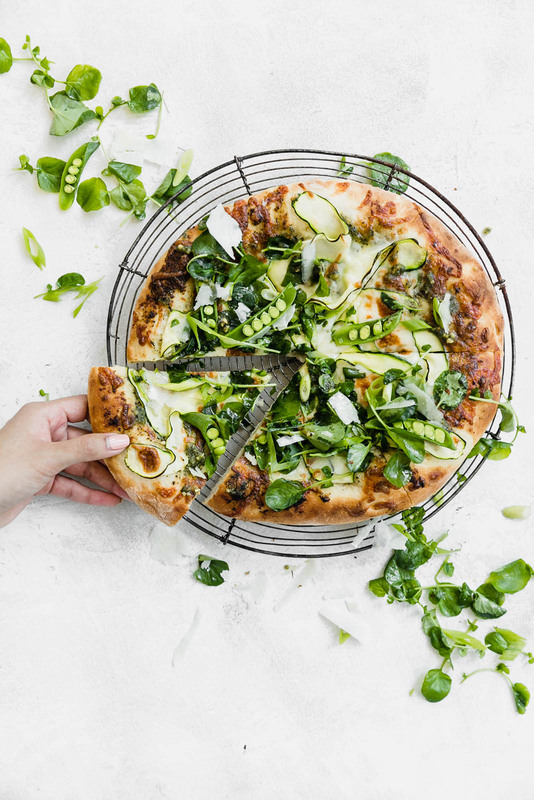 Don’t overload the toppings — I love me a fully loaded pizza, but try not to put too many toppings on this green pizza. 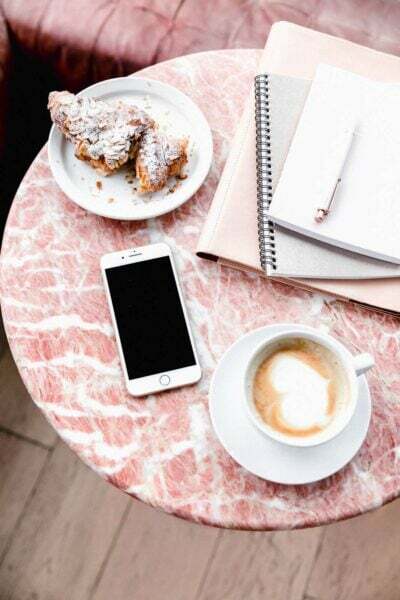 You want to taste a little bit of everything when you take a bite — the crust, the pesto sauce, the mozz, the green goddess vegetables — not just the toppings. 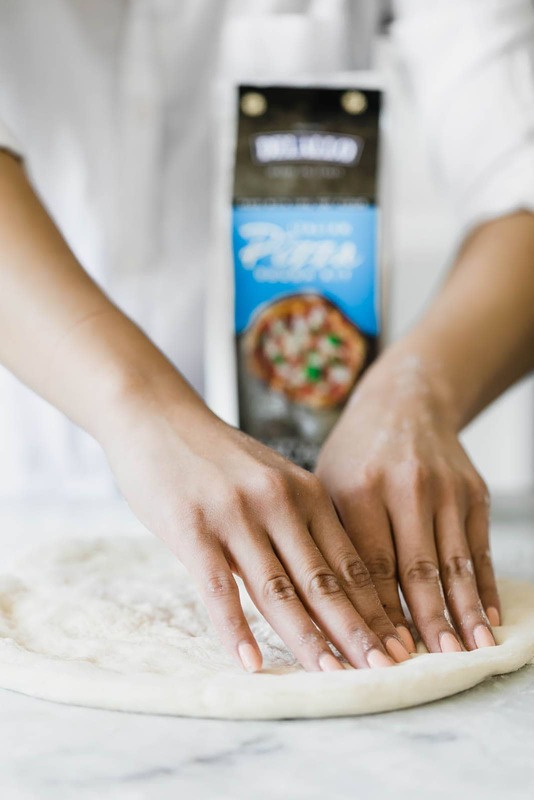 Leave room for the crust — When spreading the pesto onto the pizza dough, leave a 1-inch border around the crust and brush it with a little olive oil. The crust is one of the best parts of this pizza, after all! Thinly slice the zucchini — Zucchini has a really high water content, so you want it to be super thinly sliced when used as a pizza topping. If the zucchini is sliced too thick, it won’t cook all the way in the oven and may make the crust soggy in spots. Set the oven as high as it’ll go — For the most authentic homemade pizza, you need to bake your spring green pizza at a high temperature. My oven goes as high as 525ºF, so that’s what I baked my pizzas at. Because this pesto pizza is topped with leafy greens tossed in green goddess dressing, it’s best eaten right away. If you have any leftovers, I suggest storing them in the fridge for no more than a day or two and eating the pizza cold (reheating it will make the spring veggies wilt). Don’t try freezing leftover green pizza unless you take the fresh veggies off the top first. This post is sponsored by DeLallo. All text and opinions are 100% my own. Thank you for continuing to support the brands who help make Broma possible! This pizza is everything!! And so are these photos! So gorgeous and so yummy!! A very different and yummy pizza! Green Goddess dressing is not used enough! I just made something similar last night! Pesto over red sauce ALWAYS. And a refreshing salad on top makes it feel healthier and more special. 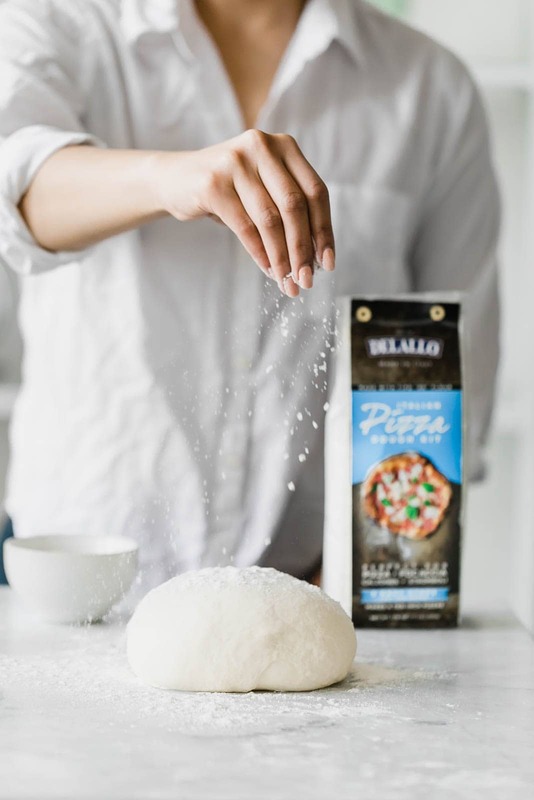 Next time I will have to try this magical DeLallo dough you speak of. Enjoy your vacation and have a margarita for me!!! This is so full of fresh tastiness! Such a dreamy pizza! DeLallo’s pizza kit is the best! I like pizza with green on it, so refreshing — thank you for this recipe!